Walmart Truck Accident Lawyers | Davis Law Group, P.S. Walmart is one of the largest retail stores in the United States. Customers can visit a store or buy products online. Due to the large number of outlets, Walmart trucks can be found on every major interstate highway, state road, and county road in the country. Walmart drivers, like all truck drivers, are pressured to make deliveries as quickly as possible — taking products from the warehouses to the stores in record time. They are often rushed to make a delivery and get on to the next stop. This situation can often create dangerous situations that cause Walmart trucks to be involved in accidents with other vehicles or pedestrians. Unfortunately, commercial delivery truck accidents, including accidents involving Walmart trucks, happen every day. If you or a loved one has been involved in an accident involving a Walmart truck, contact Davis Law Group today at (206) 727-4000. Despite Walmart's safety record, accidents involving their trucks still occur almost daily. Those accidents result in fatalities far too often. And while Walmart may do its best to prevent accidents, many times this multi-million dollar company does not step up to the plate and compensate injured victims. A company the size of Walmart has its own attorneys that work to deny or minimize accident claims. To have a fair chance after a Walmart truck accident, victims need someone on their side. The attorneys at Davis Law Group have represented thousands of people injured in large truck crashes in Washington state over the past 25 years, fighting to even the playing field. Over the years, federal and state authorities have put in place measures to reduce the number of collisions and truck accident fatalities. These regulations have not resulted in a large reduction in the accidents. Here some of the most common causes of Walmart truck accidents. Understanding the different types of collisions involving Walmart trucks is important for accident victims. 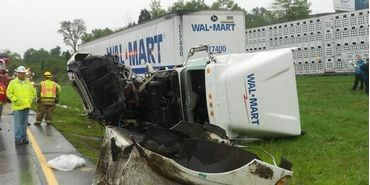 Walmart truck accidents of all types lead to some of the most severe wrecks seen on American roadways. Due to the sheer size alone, Walmart trucks can cause considerable property damage and cause catastrophic injury on a number of innocent victims. T-bone collision. When a truck driver runs a red light or blows through a stop sign, there is a good chance it will result in a T-bone collision. Head-on collision. If a truck driver goes over the center line and collides with another vehicle, the crash will almost always result in serious injury or death. Underride/override. If a passenger vehicle crashes underneath a truck, or a truck rear ends another car, the wreckage is usually severe. Rollover accident. Trucks that tip over on highways may crash down and hit other vehicles. Left-turn accidents. Trucks must make sure they have enough room to safely make a left turn, otherwise vehicles may crash into the trailer. Jackknife accident. When a truck driver brakes hard and fast, it causes the trailer to shift outward at a 90-degree angle in front of the cab. Backing accidents. Truck drivers that don’t take the proper precautions while backing may cause injuries. At Davis Law Group, our Walmart truck accident attorneys seek the most compensation for Washington state motorists who suffer injuries. We have a national reputation for successful truck accident litigation. Many Walmart truck crash victims that contact us have survived wrecks only to find themselves with a decreased quality of life. Our goal is to get them the financial compensation to move on with their lives. You’re not alone if you’ve suffered a Walmart truck crash injury. If you have a Walmart truck accident injury case, or think you may have one, call (206) 727-4000 today or contact us through our website. Your personal injury attorney should be aware of all the potential damages recoverable in a Walmart accident case. While some may be obvious — medical bills, rehab, etc. — others aren’t. Only an experienced attorney can maximize your claim and put the most money back in your pocket. At Davis Law Group, attorney Chris Davis works with the top trucking experts in Walmart truck accident cases. Many accident lawyers make the mistake of retaining experts later in the case, only to realize too late that experts should’ve been brought in right after the crash. Experts may be used on your case for a variety of reasons, including to determine fault and make a valuation of your damages. Walmart and its insurance company is sure to contest parts of your case, and it’s important that you have experts on your side fighting for you. After you’ve been involved in a crash with a Walmart-owned vehicle, the odds are immediately stacked against you. But hiring an attorney with experience going up against Walmart and the big corporate insurance companies can make all the difference. Contact Davis Law Group today to begin your road to financial recovery. Call (206) 727-4000, use the chat feature below or fill out the form on this page to get started.